Your eyesight is important, so it’s natural to have questions around eye surgery and health. If our FAQ section doesn’t answer your specific question, try our help centre or contact us to speak to a specialist. How should I choose an ophthalmic surgeon? Has your surgeon been a consultant surgeon in the NHS? If so you can be sure that their training has been long and rigorous. UK trained consultants are very experienced in their chosen field. Has your surgeon had training in cornea, cataract and refractive surgery? Has your surgeon been Fellowship trained in the latest laser eye surgery techniques? Does your surgeon offer to show you their results? Can they tell you which risks apply to your case specifically? Do you meet them (not only their team) at your initial appointment? Do you feel trust and confidence in their skills and expertise? Have they been recommended to you by another surgeon, doctor or optometrist? Are they professional when dealing with you – not applying pressure on you to go ahead with the procedure? Are their team sensitive, warm and helpful? Why do some people not like wearing glasses or contact lenses? Firstly, some people don’t like the effect that glasses have on their peripheral vision. This is particularly noticeable when they’re playing sport or driving. Glasses often steam up or smudge giving patients glare and halos and a reduced quality of vision. Glasses are also not very good at correcting significant levels of astigmatism, so this will lead to patients having a suboptimal level of vision even with glasses on. People often misplace or break glasses which leads to frustrations and high costs. On the other hand, contact lenses result in a different set of problems. Their prolonged use deprive the surface of the cornea of oxygen resulting in the growth of blood vessels into the cornea and occasionally scarring. They can also desensitise the cornea resulting in dryness, and a break-down of its surface. Finally – and rarely – their use can be associated with sight-threatening infections. How safe is vision correction surgery these days? The risks of laser vision correction have now reduced so considerately that the lifetime risk of contact lens wear is greater than the one-off risk of laser vision correction. The evolution of technology combines with excellent surgical skills has resulted in a quantum leap in the safety and success of vision correction procedures. There is now plenty of long-term (25 years or more) scientific data supporting the use of laser vision correction, implantable contact lenses or refractive lens exchange surgery in appropriately selected individuals. This data shows the long-term safety as well as long-term stability of the surgery. If done appropriately, vision correction surgery should be of permanent benefit for the patient. If patients are properly selected and treated the benefit of laser eye surgery should be permanent. However there is a small chance that an enhancement will be required within the first two years. For most prescriptions Vision Correction London’s enhancement rate is only 1%. The enhancement rate can be higher than this for less common prescriptions and if this is the case then Mr Mearza will inform you of this during your consultation. Are there risks involved in laser surgery? All medical and surgical intervention involves risk but the likelihood of complications carries greatly depending on the training and skill of your individual surgeon and the type of procedure begin carried out. It’s critical that your surgeon has a very high level of training, experience and expertise so that the risk of a significant complication is very low. If you are considering laser eye surgery it is sensible to be educated and informed about any potential risks before you begin treatment. When you meet with Mr Mearza he will take the time to explain the risks and benefits of the procedure he is recommending so that you can make a fully informed decision about whether to go ahead with treatment. How long is the recovery period after laser eye surgery? Most people will be able to resume normal activities as little as 24 hours after surgery and notice an improvement in their vision straight away. At the clinic, you will be given three types of eye drops to use at home: antibiotic drops, lubricating drops and steroid drops. You will also receive clear eye shields to wear at night for the first night after surgery. We will give you full instructions on how to use them, as well as written details for reference. It is important to follow the instructions you are given to help your eyes to recover as quickly as possible. 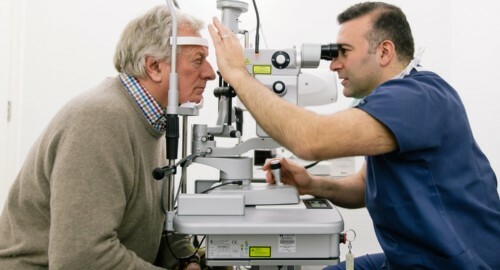 Our help centre is a great source of information about eye care and eye surgery. Our world-class eye surgeons have compiled a collection of articles to answer any questions you might have.